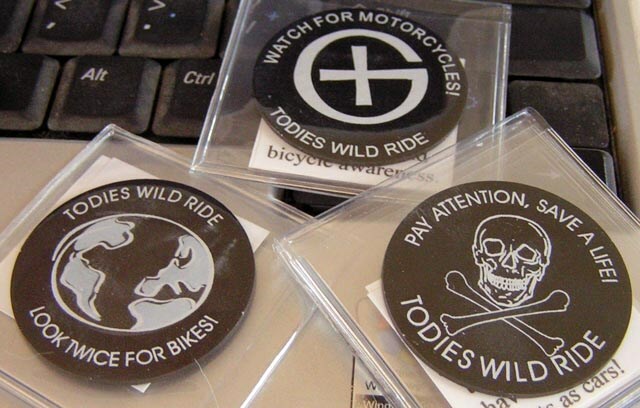 (TB30DNY) GeoCoins.net Trackable Token Geocoin - Todie's Wild Ride II: Ride safe! Todie's Wild Ride II: Ride safe! In the hands of calystraluv. Use TB30DNY to reference this item. Gallery Images related to Todie's Wild Ride II: Ride safe! Hi, I found this at my very first cache. I will pass on as soon as I go caching again. Discovered this one in Kick Off. You've been here a while....time to free up some space in the hotel and send you on your way! Discovered this one in a cool cache location. Discovered going cache maintenance today - great coin! Dropped off our first on Sunmeadowlarks Todie's Wild Ride coins today and on Tod's birthday. We drove about 40 miles total before dropping off this coin today. Here is the good, the bad, and the ugly on the trip. 1 The Good - While driving down I-75 there was a highway information sign that said Motorcyle Awareness Share the Road. A great thing to see above the highway - we would have liked to get a pic with the coin but can't pull over on I-75 when everyone is driving 70-80 mph. 2 The Bad - There is no helmet law in Florida and of the 5 motorcyclists we saw only 1 had a helmet on. He was biking like the highway was his own personal slalom course - weaving through heavy traffic that was travelling 70-80 mph, so he had to be going 80-90 mph. 3 The Ugly - Watching an 18 wheeler cut across 2 lanes of traffic at highway speed to get to the exit for I-4 as he is driving by. Just missed hitting a small car. Got the coins in the mail last night. Great reason to get out and do some caching today. Will place the first one this afternoon.